The United States and the European Union declared a “new phase” in relations in reaching a trade deal and putting brakes on escalating tension, with German leaders hailing the agreement as an important step that benefits both sides of the Atlantic. The DAX, Germany’s blue-chip stock market index, jumped 1.8 percent the day after the announcement. European shares also climbed, rising to a six-week high. The pan-European STOXX 600 index rose almost 1 percent on the news. 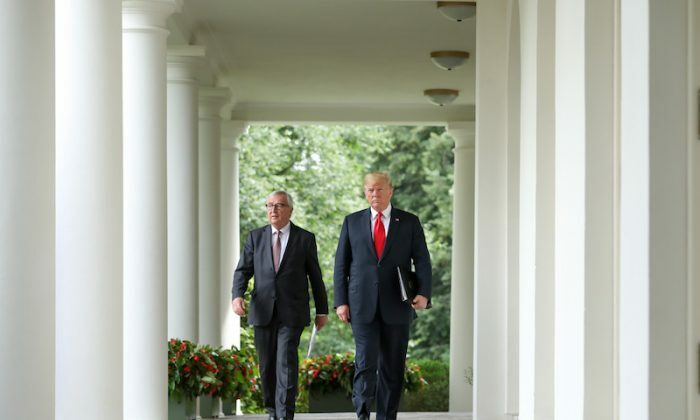 On July 25, Trump and European Commission President Jean-Claude Juncker agreed to work together to eliminate tariffs and other trade barriers on all industrial goods other than cars. Both leaders also agreed to cooperate against unfair Chinese trade practices and reform the World Trade Organization (WTO). The Trump administration agreed to put on hold any new tariffs, while the EU pledged to increase imports of American soybeans and liquefied natural gas (LNG). According to Germany’s foreign minister, Heiko Maas, the result was well above expectations. “This is still not the outcome that we are aiming for,” he told reporters in Seoul. But “it has made a positive outcome more likely than it was beforehand. “America and Europe are not opponents. … We are partners and allies with common values and interests,” he said, adding it was good that both sides agreed to resolve unfair trade practices and reform the WTO. German economic minister Peter Altmaier applauded both Trump and Juncker. “Breakthrough achieved that can avoid trade war & save millions of jobs! Great for global economy,” he wrote on Twitter after the announcement. Trade and investment flows between the United States and the EU create the world’s biggest economic relationship. The economies have a trillion-dollar bilateral trade relationship and account together for about half of the world’s GDP. “The automotive industry regards the removal of import duties and non-tariff trade barriers on both sides as the right path to take,” VDA President Bernhard Mattes said in a press release. He urged the leaders to commence negotiations quickly and put the agreement into practice. “The United States is a strategically important market and production location for the German manufacturers and suppliers,” Mattes said. German carmakers, including BMW, Daimler, and Volkswagen, operate more than 300 U.S. plants and employ more than 118,000 people. And they build more than 800,000 vehicles per year in the United States, with over half of those exported to Europe, Asia, or the rest of the world, according to the VDA release. Mattes also welcomed the intention to remove non-tariff trade barriers between the EU and the United States. As part of the deal, both leaders agreed to establish a dialogue on standards to ease the non-tariff barriers and to lower costs. U.S. exporters face challenges in accessing the EU market, as many of their products that conform to international standards cannot meet strict EU standards. “The mutual recognition of standards, and regulatory cooperation eliminate unnecessary bureaucracy and reduce costs,” Mattes said, adding this would create more opportunities to small and medium-sized companies in particular, and boost competition. Germans have been particularly concerned about the trade war, as Trump specifically focused on German carmakers in tweets that were critical of the EU’s high barriers to American cars. The EU applies a 10 percent tariff on passenger vehicles, whereas the United States imposes a maximum 2.5 percent tariff on imported cars. Trump earlier asked EU leaders to scrap all tariffs and non-tariff barriers to American cars imported into the bloc. He said he would otherwise impose a 20 percent tariff on all EU cars coming to the United States. Under the new deal, both sides agreed to halt any new tariffs for now, including on autos, pending the outcome of negotiations. However, not everyone is happy with the result. According to critics, the EU only managed to achieve delaying new tariffs, while existing tariffs on steel and aluminum imposed by both sides would not be lifted but “re-examined” for the time being. The critics also say the EU made actual concessions, promising to boost its imports of soybeans and LNG. “What Mr. Juncker achieved over there was not a success,” Bernd Lange, a trade expert for the SPD party, told German public radio. He criticized Juncker for caving to Trump’s demands and failing to halt tariffs on steel and aluminum. U.S. Commerce Secretary Wilbur Ross told reporters on July 26 that steel and aluminum tariffs would remain in place during the negotiations. Ross also said Trump had directed him to “continue the investigation” into auto tariffs, adding that the investigation report would be completed in August. According to the Financial Times, Mark Rutte, prime minister of the Netherlands, was among the leaders who welcomed the US-EU agreement, saying that it was “very important” cooperation. However, French President Emmanuel Macron was more cautious, saying Paris would seek “clarifications” on the agreement. “Europe and France never wanted a trade war and the talks yesterday were, therefore, useful” in reducing the tension, he told reporters after a meeting with Spanish Prime Minister Pedro Sanchez in Madrid on July 26. According to the AFP, Macron opposed including agriculture in any trade deal with the United States. “I believe that no European standard should be suppressed or lowered in the areas of the environment, health or food, for example,” he said.